No spilt milk on the tunnel floor, just the featherless carcass of a Swan that took an almighty bludgeoning. 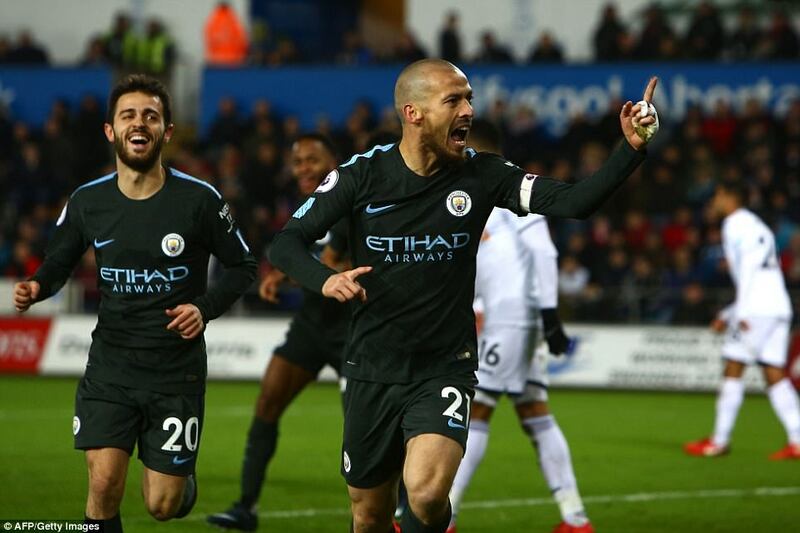 Manchester City can play their music as loud as they want if they keep this unprecedented and absurd run of form going. This was their 15th straight win, making a top-flight record, and who will end it? Who will stand in the way of such an immense force and not get trodden into the frost? It is premature to add this vintage to the discussion of the Premier League’s all-time finest because the job is not yet done. But it will be soon enough at this rate and when it is, they will have to be prominent in the reckoning. An invincible season? Quite possibly, from the body of evidence garnered this side of Christmas. Funny thing is, this was by no means their best performance. Impressive, yes, and often it was thrilling by virtue of the sheer pace of their moves, but it was still rather wasteful when you consider they made 23 chances, many of which were clear cut. 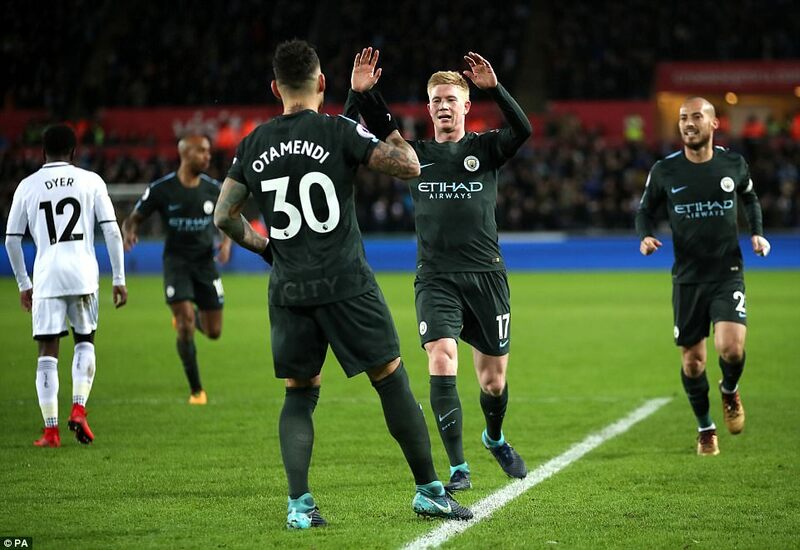 Yet there is also a message in that for the rest, because the bottom line is that City travelled to another country with a half-strength team, blew a load of opportunities and still battered Swansea to the boundary rope for four, with David Silva scoring his fourth and fifth goals of the season with exquisite finishes either side of a Kevin de Bruyne free-kick. 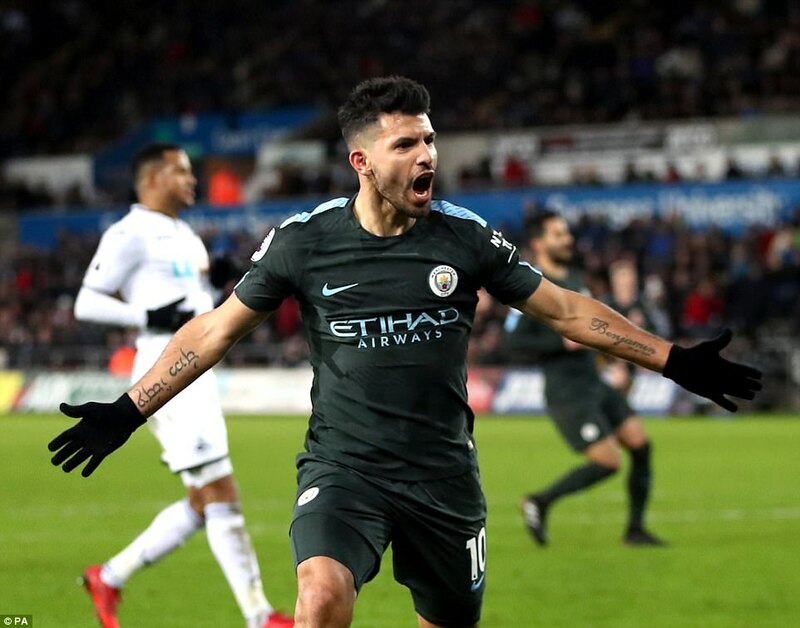 Sergio Aguero added the fourth and that strike was none too shabby either. 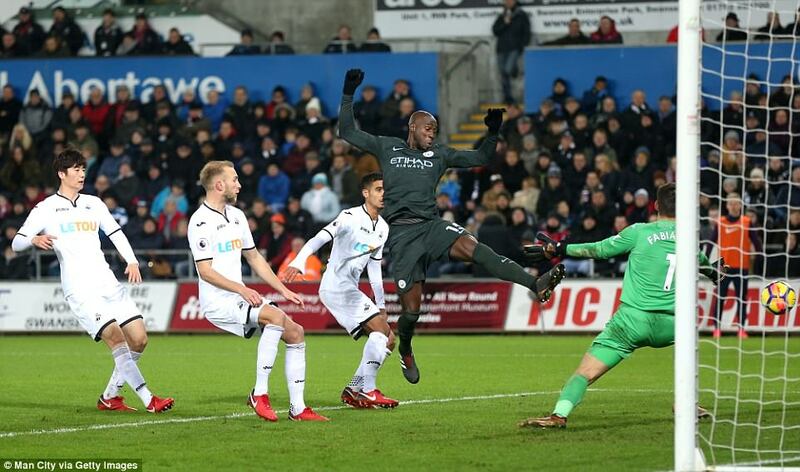 But the job was made easier by Swansea, because just as City seem set for a certain fate this season, so do their Welsh opponents. They received no mercy here, though, just the hard realities of having to make do with 22 per cent of possession on their own pitch. It was cruelty but a beautiful kind of cruelty. 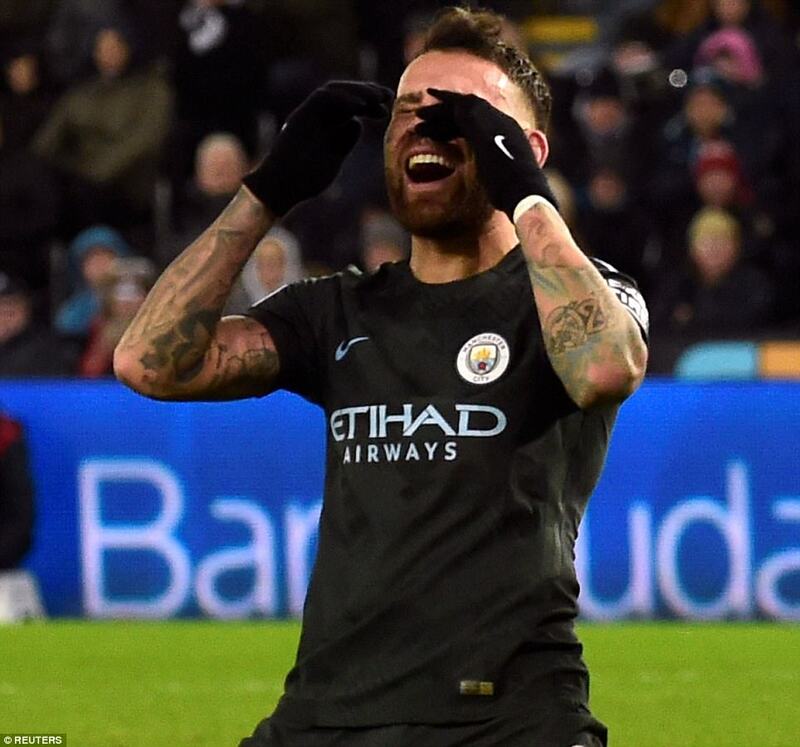 When it was all done, City returned to their dressing room and cranked up the volume to their music and it was so loud that it drowned out the press conferences. There is something distinctly amusing in that considering the dramas of Old Trafford and the tetchiness that played out on Sunday. ‘Bit loud,’ Paul Clement said, but it was with a smile. Just about his only one of the night. 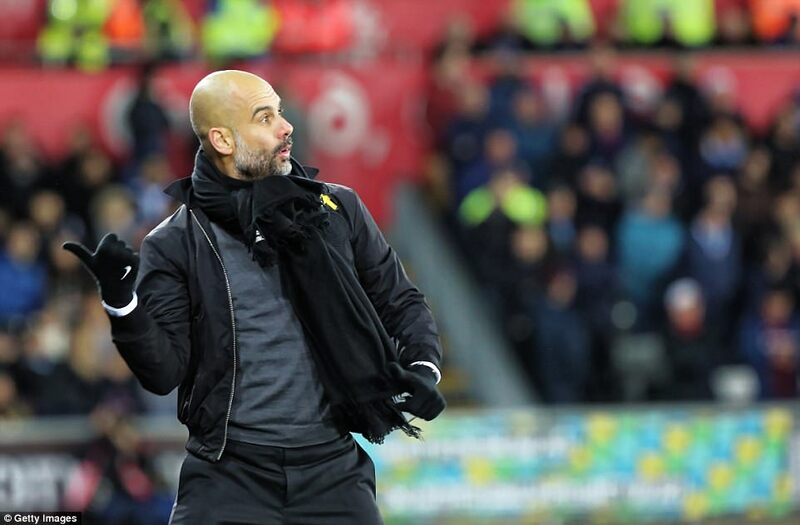 ‘No problems this time,’ said Guardiola of the music, and not a care in his world to boot. 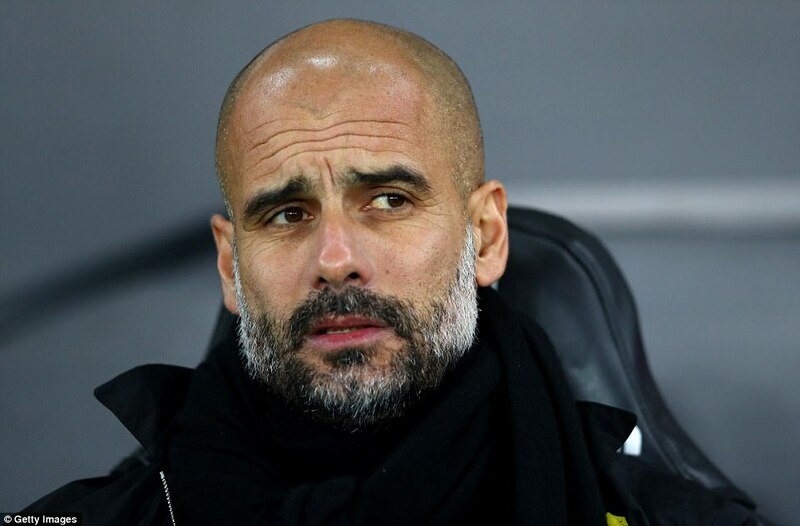 It is a measure of his genius that he now holds the longest ever winning runs in the Premier League, La Liga and the Bundesliga. 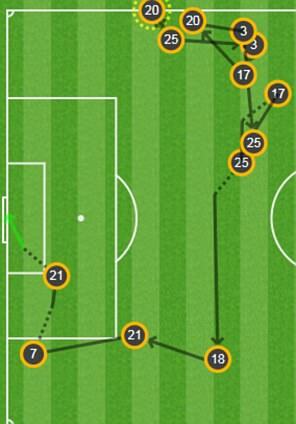 Silva’s second goal came at the end of a flowing passing move from the visitors on Wednesday night. Of course, though, this game was never likely to ruin the party – the scale of disparity between these clubs is huge. Silly, really. Never mind the table and that this was top against bottom, one of the most glaring signifiers of the inequality came in the team adjustments from the weekend. 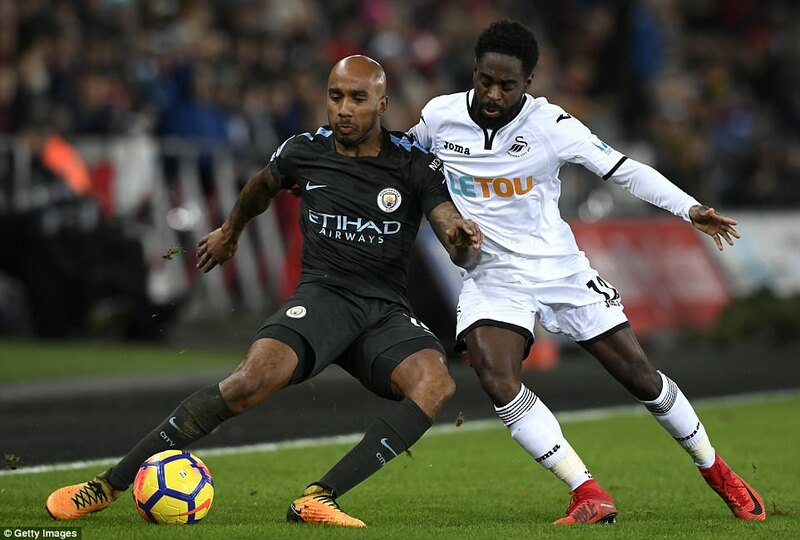 In recalling Danilo, Eliaquim Mangala, Aguero and Bernardo Silva in place of Kyle Walker, Vincent Kompany, Gabriel Jesus and Leroy Sane, Guardiola was able to lay his hands on £143m worth of back-up boys who probably wouldn’t be in his first choice XI. Staggering if you have those options for long away days and cold nights in other countries. Certainly, Swansea live on a different planet in those terms and just about any other. They always have in this division, but the kicker over the past six years was they somehow, through force of will or clever signings or a defined style of playing, managed to kick the big clubs in the crotch from time to time. March 2012, and a 1-0 win in this very fixture, for instance. But those days seem so long ago. Now they have no discernible style and depend on a squad that is by a large margin the worst they have had in their Premier League era. The differences showed themselves here almost immediately. Aguero, Raheem Sterling and Fernandinho all caused serious worries in the first six minutes alone. 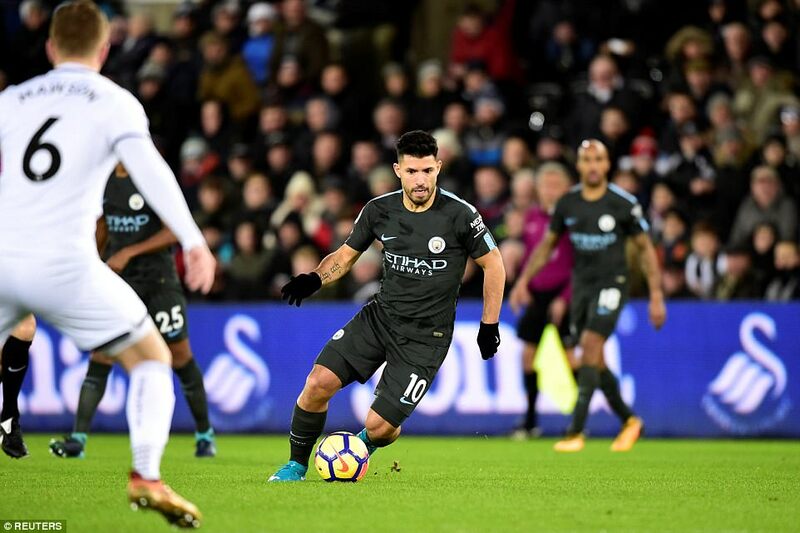 More chances came for Aguero and they all went wayward. 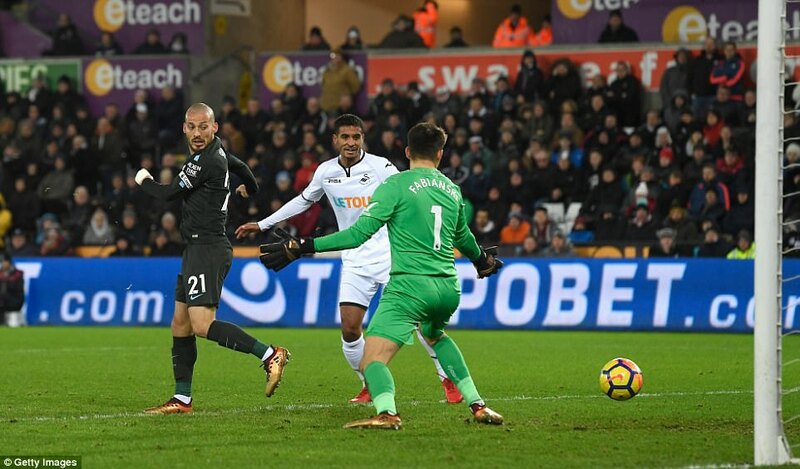 When it came, the opener on 27 minutes was as much down to Swansea’s bungling as Silva’s ingenuity. 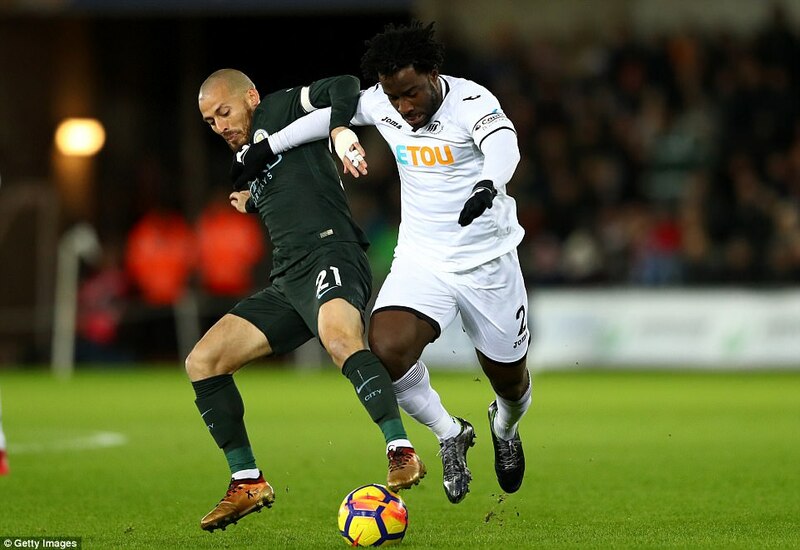 In the first instance, it was Roque Mesa who made a hash of a short pass, putting it out of the reach of Tom Carroll on the edge of his area, and from there Bernardo Silva dropped a cross over Mike van der Hoorn’s head. David Silva contorted his body in flight and flicked out a boot to nudge past Fabiasnki. 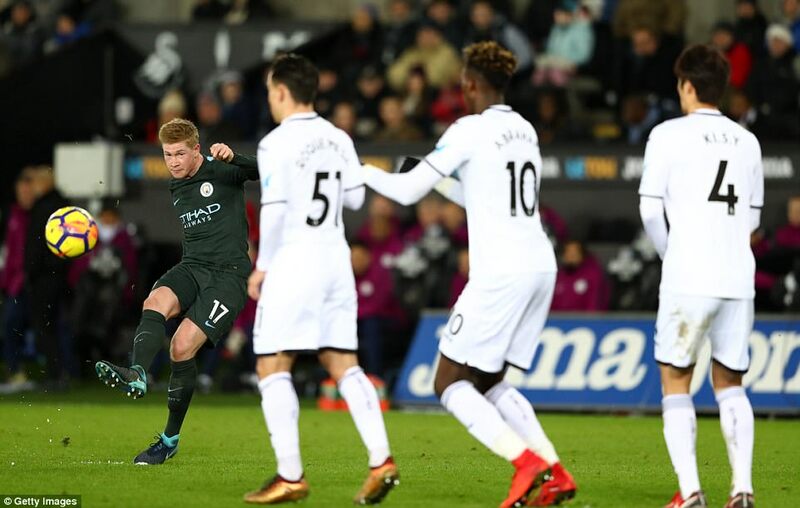 Seven minutes later and De Bruyne made it 2-0 with free-kick from the left-hand angle of the box. 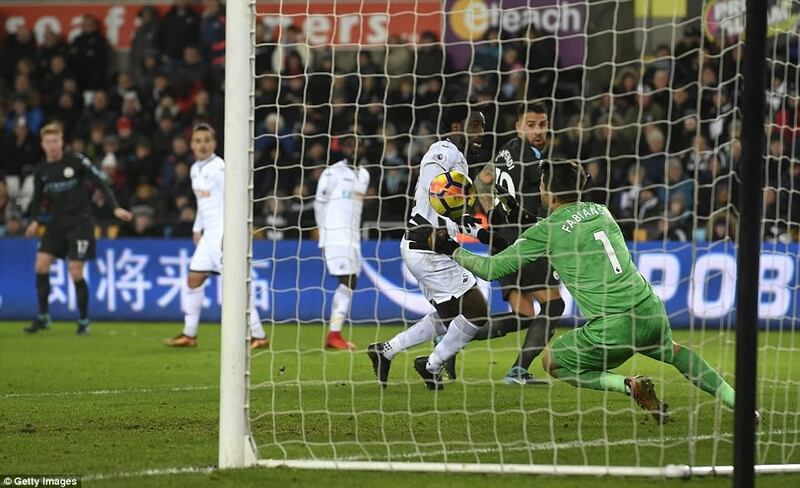 It bounced on the six-yard line and went all the way the through, a cross that Swansea’s defence allowed to become a goal. 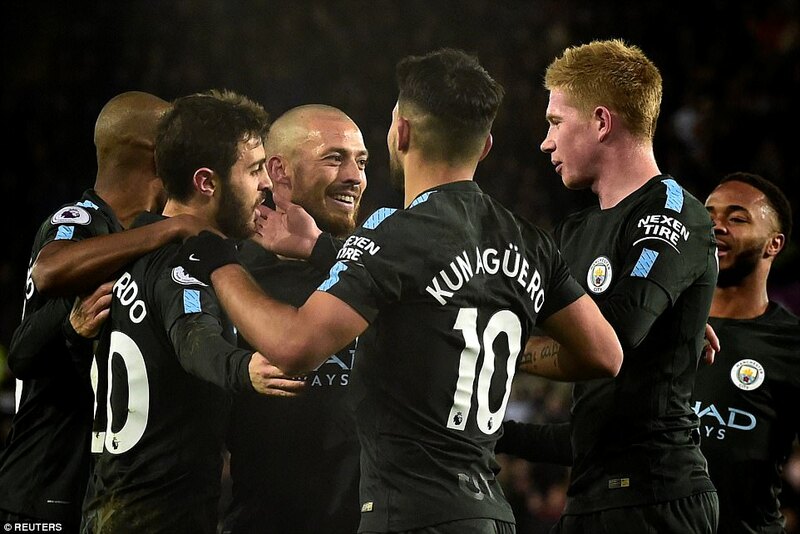 David Silva made it 3-0 early in the second half when put through by Sterling. 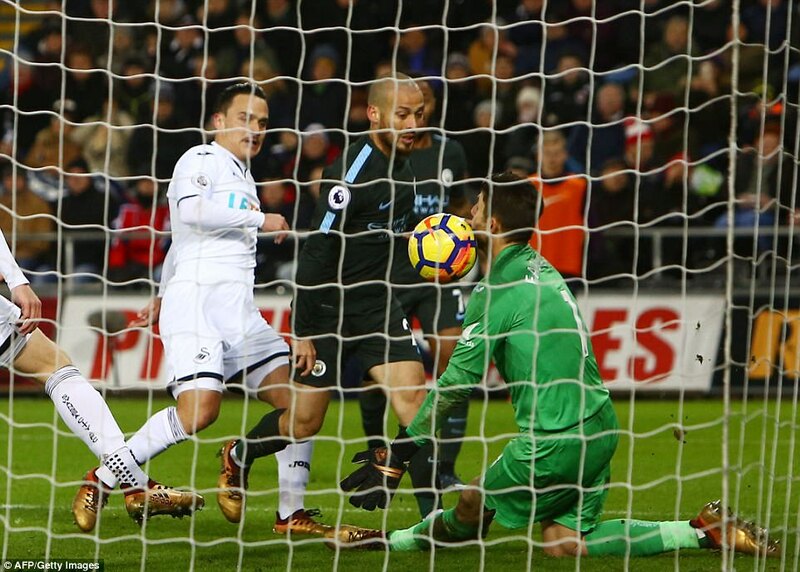 Mesa was nipping at his heels but still the Spaniard had the calmness of mind to wait for Fabianski to go to ground before scooping over him. Delightful. It was his fifth goal of the season after four in the entirety of the last – this side is making progress all over. 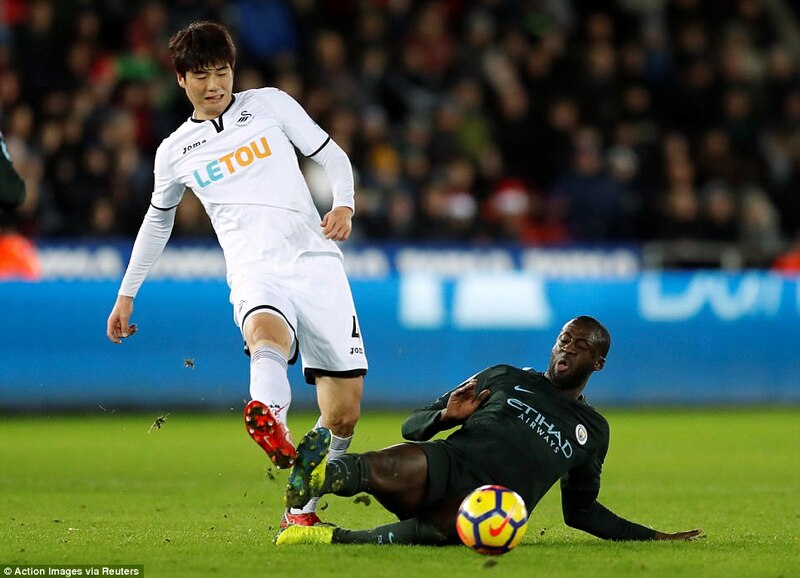 From there, only more suffering for Swansea, with Aguero taking possession from Yaya Toure and running away from two challenges before finishing across Fabianski. 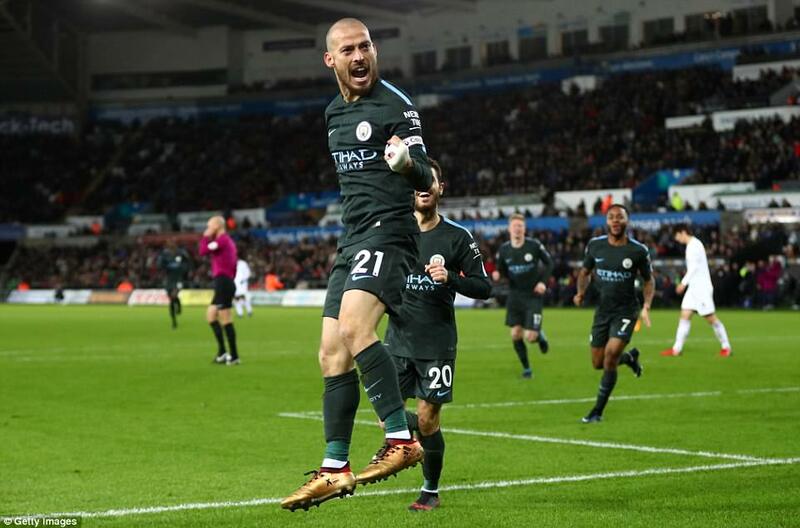 Even then, City defended like madmen to keep the clean sheet. ‘That’s as impressive as anything else they did,’ Clement said. Respect, to borrow Jose Mourinho’s buzzword – it has to be earned and City have done that.